Pay-TV signal piracy is a multi-billion-dollar problem in Latin America and the Caribbean. It poses daunting challenges for pay-TV operators, programmers, governments and consumers alike. In fact, the Alianza Contra la Piratería de Televisión Paga en América Latina (Alliance Against Pay-TV Piracy in Latin America), or ALIANZA, estimates that, when all forms of piracy (except the online variety) are taken into account, users of stolen and underreported pay-TV signals exceed subscribers of any legitimate pay-TV service in the region. About 27% of the approximately 89-million Latin American and Caribbean households (HHs) with pay-TV enjoy it through signal piracy, excluding its online variety. Estimates for online piracy in South America point to about 110 million individual users. 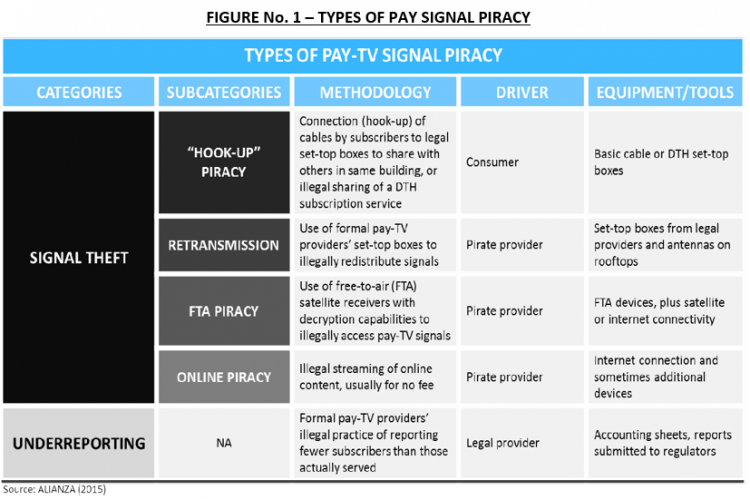 This document describes the most common types of signal piracy and highlights estimates of its cost to and negative impact on the pay-TV industry, programmers and governments. Today, pay-TV signal piracy stands out as the No. 1 competitor of pay-TV operators and programmers in Latin America and the Caribbean. 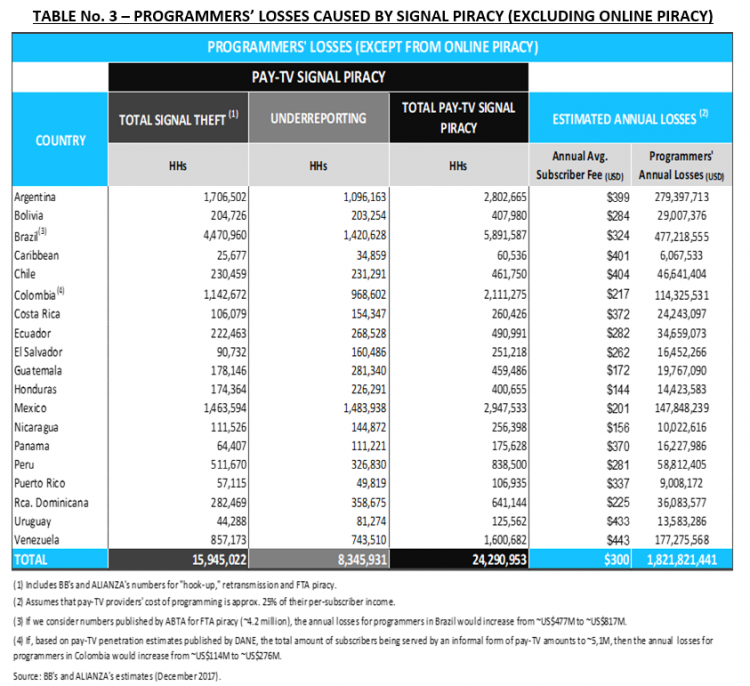 ALIANZA has identified five main types of pay-TV signal piracy that currently impact the Latin American and Caribbean market. They differ by (1) methodology; (2) driver of the illegal conduct (i.e., consumer, provider); and (3) equipment or tools required to provide or access the stolen signals. As shown in Figure No. 1, “hook-up”, retransmission, FTA and online piracy are all forms of signal theft, in which a consumer obtains illegal or unauthorized access to pay-TV signals or audiovisual streams. Underreporting occurs when pay-TV operators license signals properly but underreport the number of subscribers to their services and, as a result, pay lower intellectual property royalties and lower taxes and fees than otherwise due. In cases of underreporting, unlike signal theft, end users do not take actions enabling piracy and may not even be aware of the improper use of the pay-TV signals they receive. By its very nature, estimating the extent of piracy and illegality is a challenging task. However, ALIANZA has developed models to do so that are considered accurate in the industry. “Hook-up” piracy, retransmission and underreporting: These are the most traditional forms of pay-TV signal piracy in Latin America, the Caribbean and elsewhere. To estimate the penetration of these forms of piracy, ALIANZA relies on market research conducted by Business Bureau (BB). With over 25 years’ experience in the industry, BB conducts telephone surveys throughout the region. Overlaying this information with demographic and other market information, it has developed estimates of the number of households enjoying pay-TV services. By comparing these numbers to subscriber numbers officially reported by pay-TV operators to national regulatory agencies, as well as privately reported to programmers, BB is able to derive an estimate of how many recipients of pay-TV services benefit from piracy in the form of illegal connections (“hook up”), retransmission or underreporting. For a more detailed explanation of BB’s methodology and practices, see Annex No. 1. FTA piracy: BB’s experience shows that users of FTA services have greater awareness of the illegality of these services, and therefore are much less likely to respond affirmatively to telephone inquiries about whether they receive pay-TV services. Therefore, BB does not provide estimates of FTA services. However, ALIANZA, through its investigation of the importation and sales of illegal FTA receivers, as well as through the intelligence gained by it in a number of important enforcement actions against servers used to illegally distribute transmission keys, has developed its own internal estimates of the penetration of FTA piracy. Based on such investigative and intelligence information, ALIANZA estimates that by 2015 there were at least 4 million households receiving pay-TV signals through illegal FTAs. Online piracy is completely outside the scope of BB’s audits and ALIANZA’s estimates; it is not included in this section. For purposes of clarity, Figure No. 2, below, shows the interrelationship between and the magnitude of the two major types of pay-TV signal piracy, namely, signal theft (except online piracy) and underreporting. According to BB’s and ALIANZA’s estimates, by December 2017, the total pay-TV market in Latin America and the Caribbean  consisted of over 89 million households, and 27% of those (~24.2 million households) are pay-TV signal piracy users. A breakdown of these estimates is detailed in Table No. 1, below. FTA piracy, estimated by ALIANZA at ~4 million households (2015 estimate). Underreporting, consisting mainly of households that are not reported by legal pay-TV providers as subscribers but that in fact receive the service and pay for it, is estimated by BB at ~8.3 million households. The cases of Brazil and Colombia deserve special consideration given the existence of estimates generated by third parties or official entities, which reflect a more critic size of the problem. For Brazil, if we consider numbers published by ABTA for FTA piracy (~4.2 million), the number of Total Pay-TV Signal Piracy would increase from 5,891,587 households connected with a pirate device to 10,091,587, representing a 35% of an adjusted Total Pay-TV Market of approximately 30 million subscribers. In Colombia, a survey conducted by the National Department of Statistics (DANE) shows that there were over 11 million households with pay-TV services in Colombia by 2017. However, the number of pay-TV subscribers published by the National Television Authority (ANTV) for the same year amounts to only 5,834,676 subscribers. That implies that there are potentially ~5.1 million subscribers not being reported to the ANTV, which are likely to follow under the Signal Theft or Underreporting categories explained above. If those 5.1 million subscribers are considered, the Total Pay-TV Signal Piracy for Colombia would represent 45% of an adjusted Total Pay-TV Market of approximately 11.2 million subscribers. Alianza’s monitoring and field investigations indicate that there is significant incidence of FTA in Chile. However, for purposes of methodology, we have considered the possible amount of FTA as a regional total instead of per country. If considered on a per country basis, the total amount of piracy would significantly increase in some of the countries, such as the case of Chile. The Organization of American States (OAS), through its telecommunications advisory body (CITEL), acknowledged that “subscription satellite television has been negatively affected” by the widespread use of signal theft devices “to the extent of putting its future development at risk.” CITEL has urged its member states to “set forth provisions to prevent importation, marketing and use” of such signal theft devices . Table No. 2, below, shows BB’s estimates of pay-TV providers’ total annual losses caused by signal theft, excluding online piracy. According to those estimates, pirate providers operate an illegal market of approximately $4.8 billion—an industry that does not create formal employment, does not pay taxes, fees, or royalties, does not provide quality services and does not reinvest in innovation and better content. BB estimates programmers’ losses by assuming that the programming cost is 25% of the subscriptions earned by pay-TV providers. Table No. 3, below, summarizes BB’s results and shows that programmers lose annually a total amount of almost $1.8 billion due to pay-TV signal piracy, excluding its online variety. ALIANZA is not aware of any third-party estimates of the amount of income that Latin American and Caribbean governments lose due to pay-TV signal piracy. However, based on each country’s tax regime and the estimated number of informal users, it is possible to assess the amount of funds that Latin American and Caribbean governments fail to collect from pirate providers evading tax obligations. Table No. 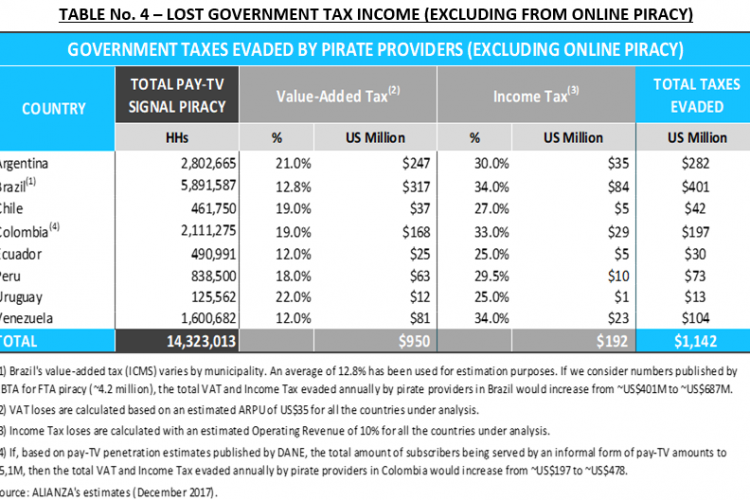 4, below, shows the amount of tax income that Latin American and Caribbean governments  would be able to collect if piracy users were served by legal pay-TV providers without under reporting. – Countries included in the estimate are Argentina, Brazil, Chile, Colombia, Ecuador, Peru, Uruguay and Venezuela. Only taking into account each country’s value-added and income taxes, the total annual amount evaded by the illegal signal piracy industry, excluding online piracy, is over $1 billion. The number would increase dramatically if all federal/municipal taxes, regulatory fees and license-associated costs (i.e., license fees, spectrum fees, landing rights, etc.) were included. ALIANZA estimates that a legal pay-TV provider creates approximately 200 jobs, both directly and indirectly, for every 100,000 subscribers. That means that almost 50,000 new jobs would be created in Latin America and the Caribbean if pay-TV signal piracy users, excluding those engaged in online piracy, were served by legal and fully reporting pay-TV providers. Table No. 5, below, shows the number of jobs lost in each country due to pay-TV signal piracy, excluding its online variety. ALIANZA requested NetNames Piracy Analysis  to conduct an investigation of the online piracy landscape and its main threats for the pay-TV industry, with a focus on television piracy activity in South America . NetNames has previously authored reports, such as Sizing the Piracy Universe, that have explored the number of internet users across a range of online ecosystems. The report prepared for ALIANZA, which is believed to be the first comprehensive review of the South American online piracy landscape, provides further insight into the scale and nature of this type of piracy in the region. It analyzes Internet usage data in the countries under study, with a focus on the three principal audiovisual piracy ecosystems, namely cyberlockers, peer-to-peer networks such as BitTorrent and Ares, and illegal IPTV streaming. The report, finalized in January 2016, estimates the number of users  accessing illegal content during a single month through each of these channels. For a more detailed description of the varieties of online piracy, see Annex No. 2. Below is a summary of the key findings of the NetNames report prepared for ALIANZA. Includes Argentina, Bolivia, Brazil, Caribbean, Chile, Colombia, Costa Rica, Ecuador, El Salvador, Guatemala, Honduras, Mexico, Nicaragua, Panama, Peru, Puerto Rico, Rca. Dominicana (Dominican Republic), Uruguay and Venezuela. Paraguay is not included because of the lack of data. For purposes of this paper, Caribbean is understood to mean Aruba, Barbados, Curacao and Trinidad & Tobago. Countries included in the estimate are Argentina, Brazil, Chile, Colombia, Ecuador, Peru, Uruguay and Venezuela. NetNames has provided piracy analysis and consulting services to content holders for more than a decade and is regularly requested by rights holders in the film, television, gaming, software and music industries to provide strategic research and advice on piracy issues. The study was finalized in January 2016 and covered Argentina, Brazil, Chile, Colombia, Ecuador, Paraguay, Peru, Uruguay and Venezuela. It is important to note that accessing users should not be understood as “unique subscribers” since users of illegal online content may also be users of legitimate or illegitimate pay-TV services.